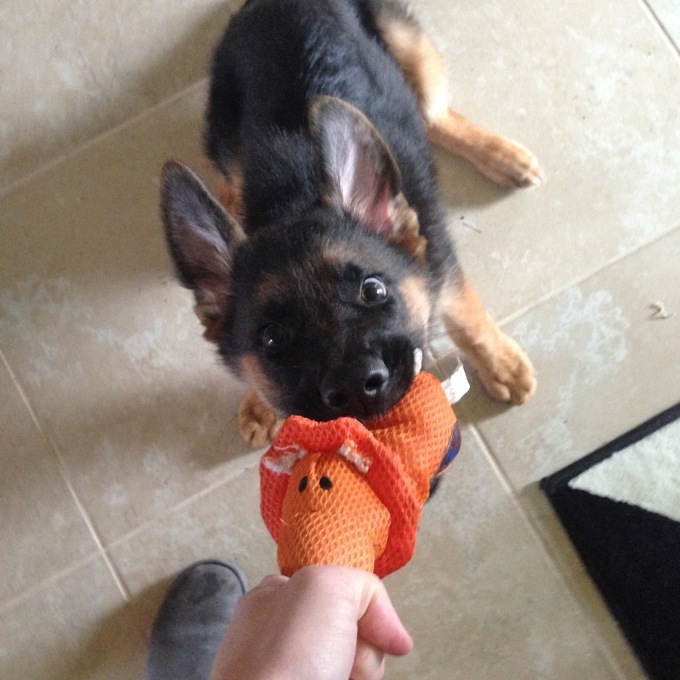 One of the things I’ve been doing in my free time is watching my friend’s super adorable new German Shepherd puppy, Otto. He’s pretty much the cutest thing ever. I kind of forgot HOW MUCH energy puppies have, and now I know that my dog can never, ever die because there is no way I can ever have a puppy in my house. I kind of like my blinds, and my shoes, and my couches, and everything else I see chewed up in my poor, poor friend’s house. One puppy might be worse than quadruplet human babies. Anyone have any live-forever potions for dogs? Kaiser is really enjoying babysitting Otto with me. 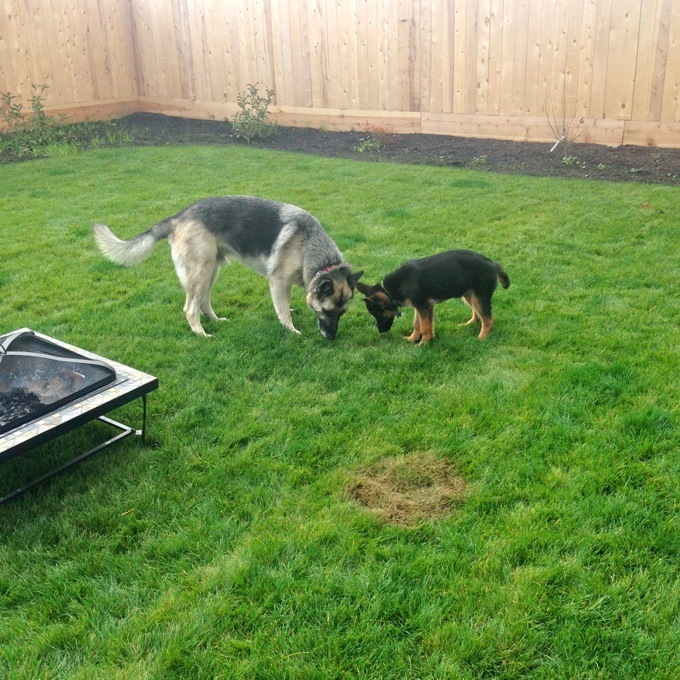 Kaiser shows him where all the good smells are at. They’re just two peas in a pod. Ok, that’s totally a lie. Kaiser is a grumpy old man. He’s only 5 (almost 6) but he acts like he’s about 40. Otto wants to play so badly. He jumps all over Kaiser, nips him, anything to entice him to play. And Kaiser just ignores him like he’s the most annoying thing in the world. HAHA. It’s actually pretty funny. 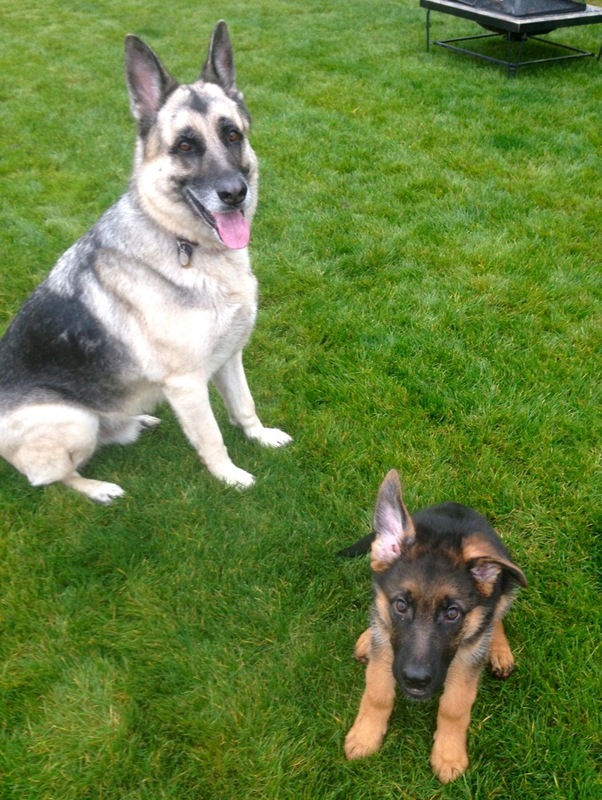 Once Kaiser realizes Otto isn’t going to leave him alone, he gives in and chases him around until he’s tired out. They’re pretty cute. Now that I have a little more time in the kitchen, I’m back to experimenting with some alternative grains, flours and sugars. I’m not against the traditional versions, I just think it’s fun to switch it up once in a while! I’ve baked with coconut flour a few times before, but I was overdue for another go around. I mentioned in my last Harvest Friday post that when I harvested a whole bunch of carrots from my garden, I got the suggestion to make carrot cake! I couldn’t stop thinking about carrot cake, but wanted to make it a little healthier and maybe turn it into breakfast instead of dessert. I thought about muffins, but donuts just seemed so much more fun! Coconut flour is slightly sweet, subtly coconutty, and bakes up really moist. It’s pretty much perfect for donuts. Plus it’s gluten-free (for those who shun the glutens!) and packed with protein. It’s really a great alternative flour, but it cannot be swapped 1:1 with wheat flour, so don’t substitute regular flour in this recipe. 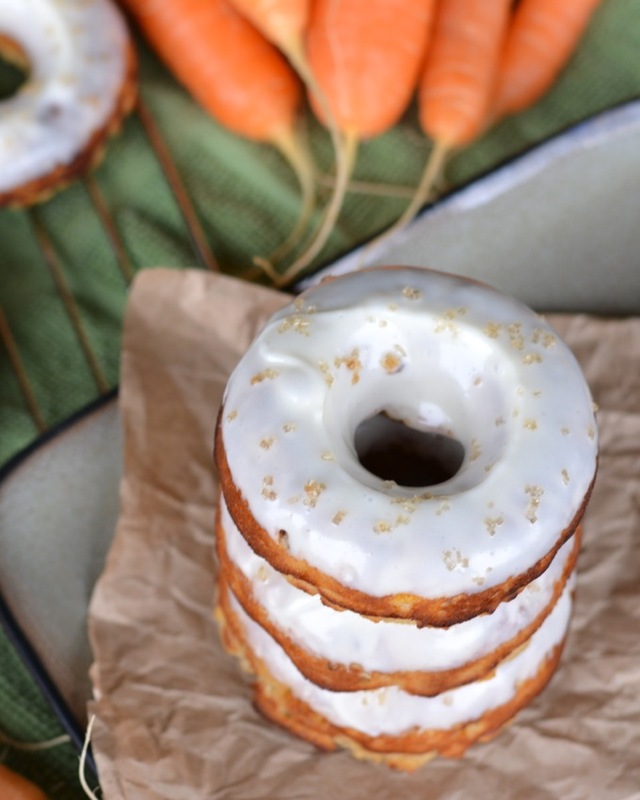 Carrot cake wouldn’t be complete without cream cheese frosting, so I dunked these donuts in a cream cheese glaze. But trust me, if you’re not feeling the glaze, the donuts are 100% delicious without it, too! Preheat oven to 400 degrees. Spray two 6-donut pans with nonstick spray. In a large bowl, whisk together coconut flour, baking powder, salt and spices. In another bowl, lightly beat eggs, then add butter, honey and vanilla and whisk to combine. Pour the wet ingredients into the dry and mix well until no lumps remain. Transfer the batter to a pastry bag (you don't have to do this, but I find it easier to get it into the donut pans without making a mess) and pipe evenly into donut pans. Bake 10-12 minutes, until edges are just turning golden. Cool in the pan a few minutes, then transfer to a wire rack. To make the glaze: Beat the butter and cream cheese together with an electric mixer until light and fluffy. Add the powdered sugar, ½ cup at a time and beat to combine. Add the vanilla extract and beat until fluffy. Add milk as needed until the glaze is drippy enough to dunk your donuts in. Dunk the donuts in the glaze, then let set a few minutes before serving. If you don't like walnuts, you could replace them with pecans or raisins, or omit altogether. These donuts came out so moist and yummy. They didn’t last very long. And I kinda want to make them again already. Veggies in my breakfast for the win. And if you’re looking for more carrot cake inspiration, check out these ideas from some of my favorite bloggers! Ok first of all…your grass is SO GREEN!!! Omg! It is so gross here! And second of all, you are giving me puppy fever, is three dogs too many? because now I want another one! 🙂 I am loving this beautiful donuts! I adore anything carrot cake flavored (obviously) so these are right up my alley and I love they are already gluten free!! German Shepherds hold a soft spot in my heart because my family has 6 and we had 2 when I was living at home still!! 🙂 And I personally think they are the most beautiful dogs on the face of the planet, ha ha! And those donuts, ohhhh those donuts! Oh those donuts sound so good. I haven’t used coconut flour but I do have some in the pantry. Maybe now is the time? Those 3 stacked donuts look like a cake! Yes, do it!! Coconut flour is great for donuts because it bakes up sooo moist! That puppy is just the cutest, Jess! Sounds like you’re having a blast watching him! And these donuts look amazing! Such pretty pictures! I’ve never baked with coconut flour before, so I definitely need to try that out. Sounds like such a delicious donut! Love! 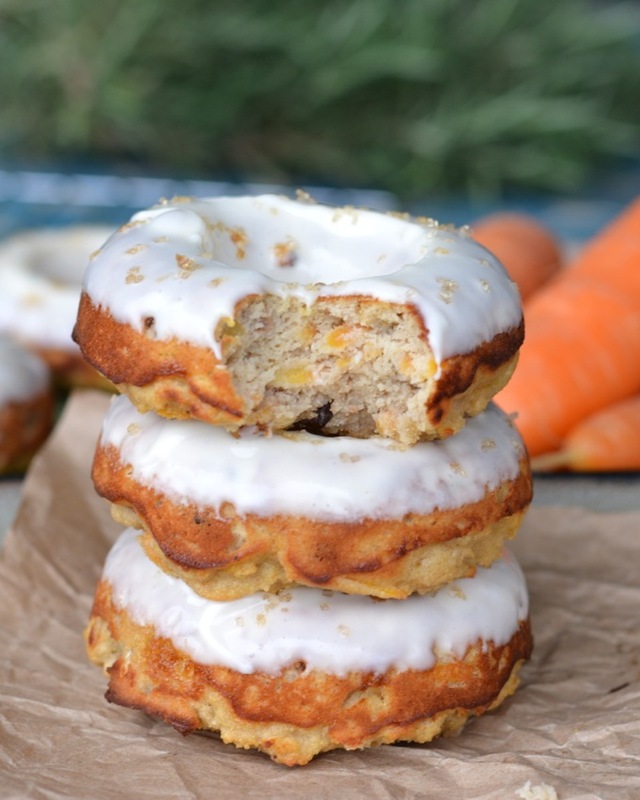 I have been wanting to make carrot cake doughnuts for SO LONG now!! This looks so good! Oh these two are so cute together! Love them both! I got my dog when she was 2, so I didn’t have to deal with all the puppy craziness. So I feel spoiled and I don’t know if I will ever be able to handle that if I get a new fur baby! These donuts. 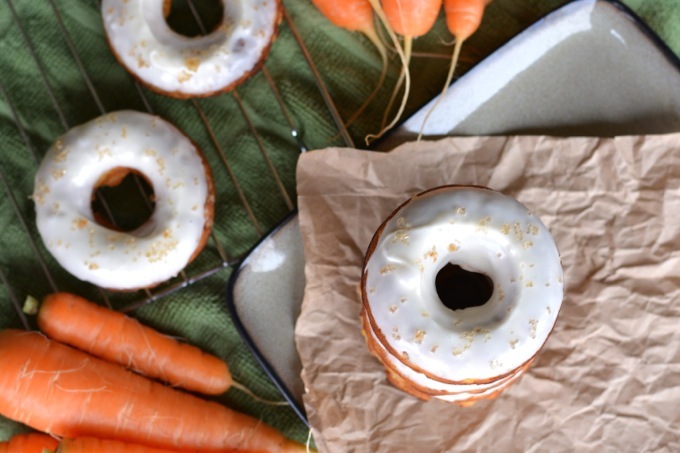 You mean we get to have carrot cake AND donuts for breakfast all at the same time? Yup – total win there! Yum! I want one! A doughnut that is, not a puppy. The baby is more work than our dogs, but then again our pups are 6 and 9. My parents have a golden puppy and he’s just starting to mature. I too forgot how much enthusiasm they have! Hey I’m a Navy girlfriend myself so it’s nice to see another food blogger like me out there. Second, my sailor loves carrot cake so I’m sure he would be delighted if I made this recipe for him! Hi Shelby!! How fun! I like following other military wives/gf’s too! Heading to check out your blog right now! Oh my goodness. The puppy. I’m dying of cuteness!! It’s so precious…and those donuts, um – heaven!! Love that you used coconut flour. Totally going to have to try these! Pinned. Thanks, Rachel!! They were SOOOO yummy!! Otto is so CUTE! Puppies are so fun, but lose their luster pretty quickly when they’re your own. We got one of my dogs as a puppy, and it felt like having a newborn baby. I was taking him out to the bathroom every 2 hours in the night. It was grueling! But soon enough he was potty trained and the best behaved dog. My 2 other dogs we got when they were already, so we got to avoid the puppy phase. And I must say that is the way to go! 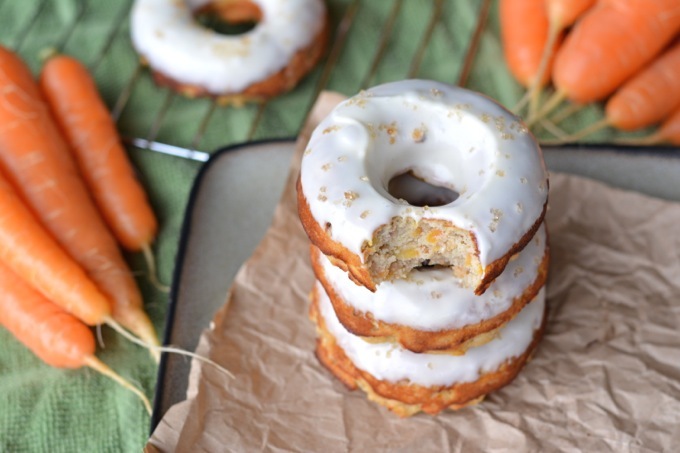 These carrot cake donuts sound delicious! I love that you used coconut flour. I’ve been experimenting with different flours too, and now I must try using coconut flour. I bet it gives it great flavor. And THANK YOU for linking to my carrot cake cupcakes! You’re the best Jess! Yeah… not sure I am cut out to be a puppy mom anytime soon! And the coconut flour is great! It has a spongier texture than wheat flour (kinda like those little strawberry shortcake cakes) but it works really well in the donuts because it bakes up SO MOIST! I have puppy fever. I mean, puppies are cute and cuddly, and I want one! But then I remember how much work puppies are and how easy my dog is at this point. Haha! As for the donuts, holy yum! SOOOO much work! My mutt is a perfect little angel and I am soooo spoiled by him! LOL!